MAN flu really does exist – in the minds of Britain’s wimpish men. In theory colds and flu affect males in exactly the same way as females. But though 41 per cent of men believe they dealt with winter illness in the same way as women, only 16 per cent of females questioned in a new survey agreed. Instead 52 per cent of women said men respond differently by wallowing and feeling sorry for themselves rather than being pro-active. 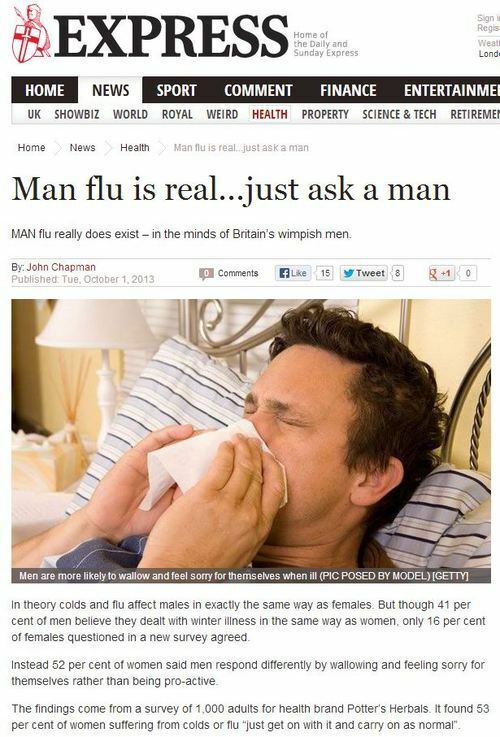 Finally, then, we have scientific proof that the concept of man-flu isn’t merely immature, ignorant and trite. The source of this scientific proof? The findings come from a survey of 1,000 adults for health brand Potter’s Herbals. It found 53 per cent of women suffering from colds or flu “just get on with it and carry on as normal”. We can say one thing for certain, at least – medical herbalists are as thorough in their PR research as they are in their scientific research, and equally adept at finding truth in both fields. This entry was posted in Uncategorized and tagged chris etheridge, daily express, john chapman, potter's herbals on October 10, 2013 by Michael Marshall.